In 1966, Snowflake, a western lowland gorilla was taken to the Barcelona Zoo in Barcelona, Spain, where he lived until his death from skin cancer in 2003. Since then, scientists at Barcelona’s Institut de Biologia Evolutiva at the University of Pompeu Fabra have been studying Snowflake’s frozen blood and using it to sequence his genome. Scientists identify the precise genetic cause of Snowflake’s albinism—SCL45A2 gene that was previously been reported in albino mice, horses, and chickens, said study leader Tomas Marques-Bonet. Both the mutant gene and the inbreeding are rare occurrences for western lowland gorillas, and the combination that produced Snowflake isn’t likely to happen again anytime soon. 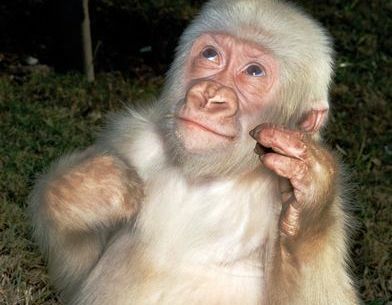 This explains why there existed only one albino western lowland gorilla.